Are there viruses of arsenic-utilizing bacteria? A salt-loving (halophilic) bacterium which can grow in medium containing arsenic instead of phosphorus has been selected from the microbial community of Mono Lake in California. Arsenic (As) is a chemical analog of phosphorus and is usually toxic because it can enter metabolic pathways in the place of phosphorus. It appears to be incorporated into macromolecules of the bacterium (called GFAJ-1) that normally contain phosphorus, such as nucleic acids and proteins. The identification of bacteria that can utilize arsenic has many metabolic and evolutionary implications. I’m wondering whether there are viruses that infect bacteria such as GFAJ-1. These conclusions seem unlikely. GFAJ-1 is a variant of existing bacteria from the family Halomonadaceae that has been selected to grow in the presence of arsenic. As Ed Yong has written, GFAJ-1 does not depend on arsenic, and there is no evidence that it belongs to a second tree of life on Earth. But let’s step back for a moment and assume that there are organisms on Earth from a second tree of life. Are there viruses that infect them? Viruses are believed to have existed either before cellular life emerged, or evolved very shortly thereafter. Was the emergence of viruses a freak accident, or are viruses found whenever life evolves? This has been a difficult question to answer since we have evidence on Earth that life evolved just once. Finding viruses that infect members of a second branch of life would suggest – but not prove – that viruses are important for the evolution of life. If no such viruses were found – and we’d have to search very hard to make that conclusion – then it would suggest that they are not needed for life. Let’s come back to earth and return to GFAJ-1. As far as I know there are no known viruses of this particular type of bacterium (although there are bacteriophages that infect members of the genus Halomonas). Are there viruses of GFAJ-1? If so, can they replicate in GFAJ-1 when the bacteria are propagated in medium containing arsenic in place of phosphorus? Or is the viral replication machinery only able to replicate nucleic acids containing phosphorus? 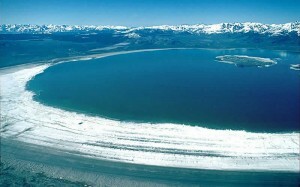 Since GFAJ-1 was selected from the Mono Lake microbial community, it is a reasonable assumption that similar bacteria are present in the lake sediments (although their prevalence there is unknown). In that environment there will always be phosphorus present, so it’s not clear if viruses could have evolved that function when arsenic is substituted for phosphorus. The research group that identified GFAJ-1 has plenty of work to do to understand the biology and ecology of this bacterium. But there are many interesting viral questions as well, and if I were part of that group, I’d be searching the genome of GFAJ-1 for virus-like sequences, and looking for viruses in the sediments of Mono Lake. Update: The Science article is receiving a great deal of criticism. Rosie Redfield has a very comprehensive review, concluding that “Basically, it doesn’t present ANY convincing evidence that arsenic has been incorporated into DNA (or any other biological molecule). My first thought was that incorporation of As into DNA (if it really does) might be an anti-viral protection, such as DNA methylation. with As-DNA. I don’t know if that question will ever be answered.